The Châteaux of the Loire Valley never cease to enchant visitors from around the world. Can you imagine drifting slowly over these architectural masterpieces in a hot air balloon guided by the winds? 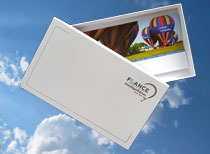 The Loire Valley has become our most popular balloon rides bases, where we take off from the Chateau of Chenonceau, Blois, Château of Chaumont, the Chateau of Azey-le-Rideau and Villandry to name but a few. 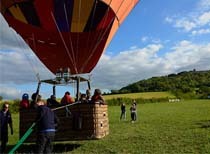 Balloon rides in the Loire valley are scheduled every day in the morning and evening when the weather conditions are optimal, seven days of the week, including national holidays, from April to October. The total excursion time is three hours with a flight time of approximately one hour. 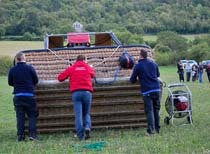 This includes the balloon preparation and inflation, the flight, the traditional "toast des Aéronautes" at the landing and the return by vehicule to the starting point. You may buy a ticket and reserve your seat on line via this site. To check flight availablity : Click on one of the red dots on the map (home page) of the area you wish to fly, then click on "Check Flight Availability" in the menu LEARN MORE. You wish to know the progress of a flight, it is here or here!